Recently I got myself an Iomega IX2-200 StorCenter. It’s a nice little device which will do nicely for my lab. When playing aroung with the device I wanted to connect it to my ESXi 4 servers using ISCSI. Yes, I’m running VMWare ESXi, main reason for that being one of my BSD guests and Hyper-V doesn’t do BSD. Below are the steps I used to utilize the StorCenter as an ESXi datastore. I’ll be using the ESXi iSCSI Software Adapter, use CHAP (could’nt get Mutual CHAP to work, anyone?) and assume networking has been properly configured. 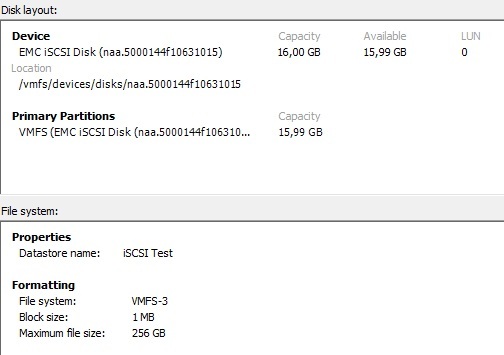 Also, in this example we’ll be using VMFS volumes for VMDK storage, not Raw Device Mappings. Note that during taking the screenshots I discovered a 1Gb test iSCSI target was too small (ESXi complained in the Add Storage / Select Block Size dialog), so I upped it to 16 GB using the StorCenter dashboard. First enable iSCSI on the StorCenter. 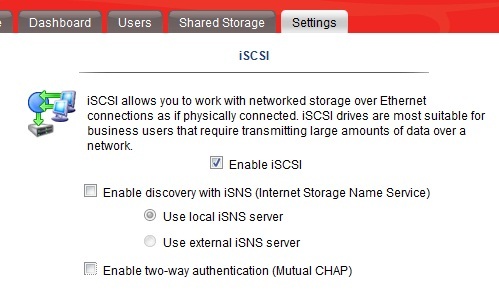 In the dashboard, select the Settings tab, click iSCSI and check Enable iSCSI. Leave iSNS discovery unchecked as ESXi doesn’t support it. Leave the option Enable two-way authentication (Mutual CHAP) unchecked. Because I’m going to use CHAP I need to create an account on the StorCenter for the iSCSI initiator (i.e. ESXi) to authenticate itself. Select tab Users and click Add. Specify a Username and a password. This password MUST be between 12-16 characters. Uncheck Administrator and Add a secured folder for this user. Click Next; when asked about Group memberships click Next again. Now specify which users have access to which folders and iSCSI drives. Check the Read/Write option for the users created earlier and click Next. In VI client, select the host’s Configuration tab and select Storage Adapters. Select the iSCSI Software Adapter, e.g. vmhba34, and click Properties. 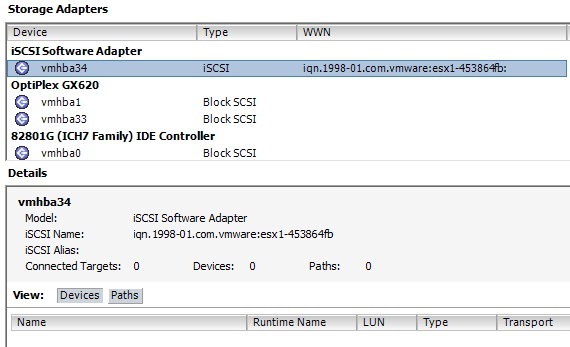 Click Configure and make sure iSCSI is enabled (enabling may require restart). Click OK to close this dialog. Now, before connecting to the iSCSI target I’m going to specify the credentials first. I’ll use global settings so new connections will inherit these settings by default. To start configuring authentication, in the iSCSI Initiator Properties dialog on the General tab, click CHAP. In the CHAP Credentials dialog, set CHAP to Use Chap and specify the Name and Secret (i.e. password) of the user created on the StorCenter. Since I’m not using Mutual CHAP, leave that setting to Do not use CHAP. Click OK.
Now I’m going to connect to the iSCSI target. Being lazy, select the Dynamic Discovery tab and click Add. Specify the address of the StorCenter. Click OK when done. The iSCSI server you just specified will now be added to the list of Send Targets. Click Close; when asked about rescanning the HBA select Yes.The iSCSI target will now be listed in the View section. In the VI client, select Storage and click Add Storage. Select the Disk/LUN Storage Type and click Next. Select the added iSCSI target. Next. Next. Specify the name of the Datastore. Next. Specify the block size and required capacity. Next. When done, click Finish. Presto! One iSCSI VMFS datastore at your disposal. This entry was posted in VMWare by Michel de Rooij. Bookmark the permalink. You saved me from a ton of trouble! Excellent guide. Thanks for sharing! Great! Thanks for your guide! Good article – thanks! 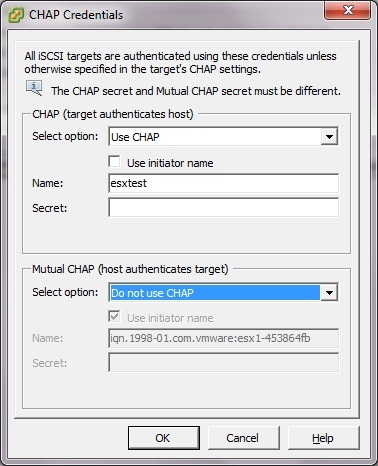 One thing I found, with ESX 4.1 and ESXi 4.1 was that I had to specify ‘Use CHAP unless prohibited …’ instead of just ‘Use CHAP’. Strange … but until I changed that setting ESX could see the iSCSI LUN but wouldn’t attach to it. Thank you!!! You save me a lot of leg work preparing my lab. Much appreciated!!! Thank you!!! Made this so simple to understand and follow. Many thanks, I agree, simple to understand and follow. Just one minor point. As a SCSI LUN newbie, it took me a while to realise that the CHAP password needed to be between 12 and 16 characters. Apart from that seamless instruction. Nice job. For one way CHAP, grant access permissions for specific user in the StorCenter. In the client (iSCSI Initiator in Windows 7, for instance), perform a connect or quick connect, but before clicking OK, go to Advanced and enable CHAP authentication. The CHAP name is the StorCenter user name and the CHAP secret is the StorCenter user password. If your StorCenter user password is less than 12 characters long, you can add ***’s to your current password until you reach 12 characters. For Mutual CHAP, you *do the same as in one way CHAP*, but *also* enable the Mutual CHAP in the StorCenter. Maybe try something similar in ESXi to see if Mutual CHAP works that way. anyone get this working with Iomega StorCenter ix2-200 Cloud edition with VMware esxi 4.1u? i’ve ensured my chap password is 12 characters +. Although the new ix2-200 “Cloud” interface is different, your guide offers enough to enable. 1. 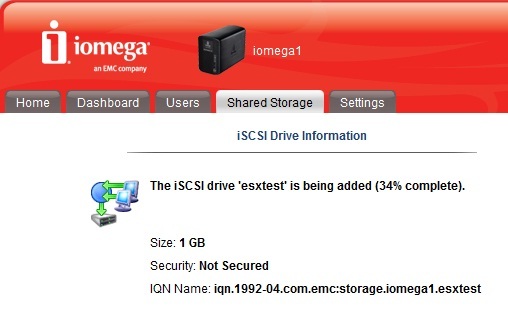 We now create the iSCSI share via – Storage | iSCSI. Just add an iSCSI “Drive”, give it a name and a size. 1a. Once created, you can see the default settings via the Settings link. Leave these as default. This gets us down to creaing the user. 2.b. Adding the Secured Folder is now done via the “Add access permissions” link at the bottom of the User detail. You should see the iSCSI Drive already created. Just select Read and Write. The rest of the VI setup is as described. 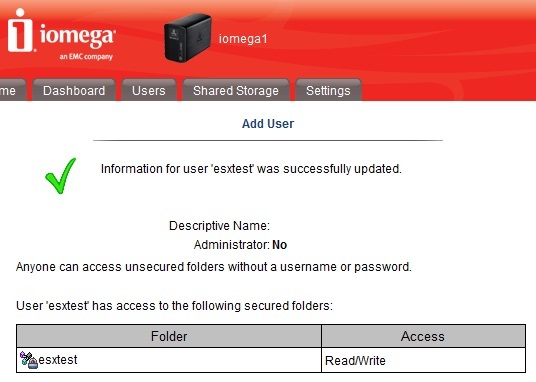 Docs at http://download.iomega.com/com/nas/pdfs/iscsi_wp_0211.pdf states that mutual chap username should be ‘iscsi’ and the mutual chap secret should be different from chap secret. But I tried at a ESXi 5.1 and did not get it.